Learn the truth about GM crops. We have a copy of the DVD and would love to host a screening in your home. Call to schedule a date. The Flavorist is a 14 minute video exposing a great deception in our food system. Learn the truth and be set free! The best way to enjoy FRESH, ORGANIC FOOD is to grow it yourself! You don't have to have experience or have a huge garden. Plant a seed....learn as you grow......grow one or two things this year, add something new every year. 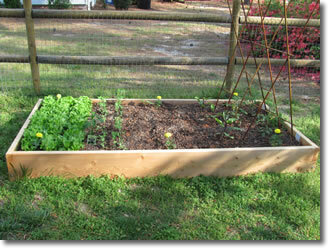 We teach two simple ways to garden, Back to Eden style or Square Foot Gardening in a Super Grow Box. 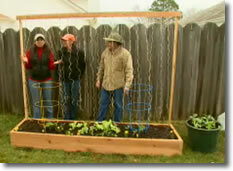 Both provide simple ways for you to grow nutritious, organic vegetables. We believe it is important for everyone to know how to grow some of their own food, recycle wastes by composting, and how to save heirloom seeds, so you never have to buy seeds again! GO "BACK TO THE FUTURE" WITH A BACK TO EDEN STYLE GARDEN! We teach a simple, yet profound way of gardening with woodchips, based on the independent film, Back to Eden. All ages can join in for a few hours of fresh air, cooperation and fun, as we lay out a Back to Eden garden at your home, school or church. Contact us to schedule a Back to Eden Garden Workshop. MAKE THE SWITCH TO FRESH LOCAL, ALL NATURAL FOODS! Grow what you can, buy the rest from local sources. Support local farms. "The land! That is where our roots are. There is the basis of our physical life. The further we get from the land, the greater our insecurity. With our raised beds you can grow using the "square foot gardening method," extend the growing season, use them as starter beds for a large scale garden, or grow flowers & herbs. These bottomless boxes, constructed of red cedar, are perfect for any yard, large or small. 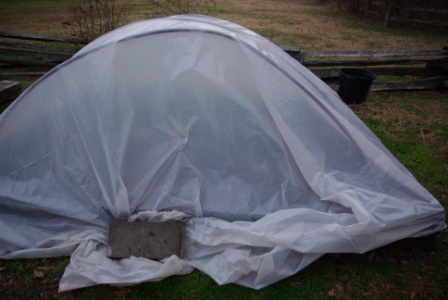 Super Grow Boxes can provide easy solutions for many problems.....installing a wire mesh bottom stops burrowing pests, adding a row cover deters birds or other invading pests, or extendyour growing season for year round production by attaching a plastic hoop house! No tilling required – ever! Grow Boxes are a good investment in your health. Not only can you decrease your weekly grocery bill by growing nutritious, delicious vegetables for you and your family, but you will also be getting fresh air and sunshine on a regular basis while tending your plants! Custom sizes available. Contact us for estimate or to order one of the sizes listed above. Boxes are ready within two weeks of order. SORRY WE DO NOT SHIP SUPER GROW BOXES. 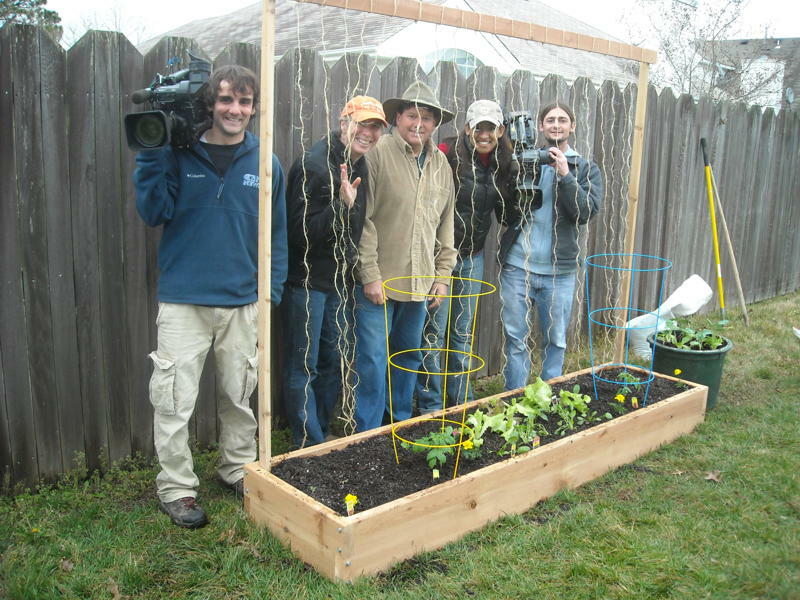 Trellis boards pictured at left with a video team from the Christian Broadcasting Network. For an addtional fee you can request delivery & installation Fredericksburg area. Send an email to the contact button below. Feel free to contact us with your gardening questions. We want you to succeed!